~*~ Oman Sky * ســمــا عُـــمـان ~*~: Again for Jeff! Well, at least I did that for you. I pushed myself to hold my pencil again for you. I drew this one 2 years ago. 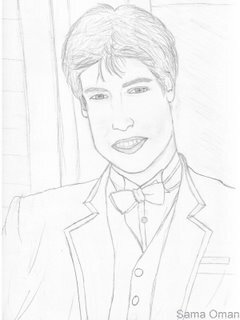 I found gorgeous picture of him when he was at Eton College. I think he was really wonderful…no not wonderful…charming and fascinating boy when he was younger until he entered St. Andrews university. Now, I don't think he is that gorgeous boy any more. I don't know why?! . He lost many things when he got older. But I still like him as a Lady Di son. How could I laugh! It's very good! I'm sorry you're not confident about the picture. But I think it's very brave to post it if you aren't confident. 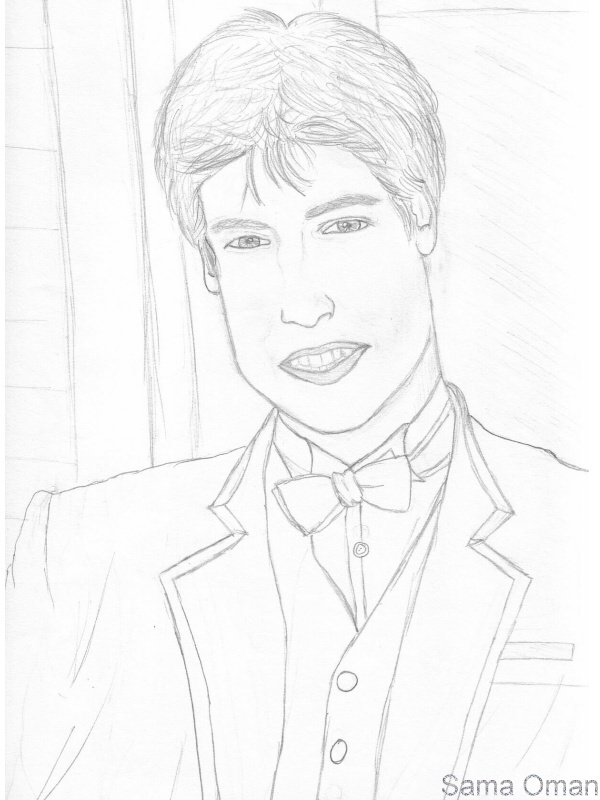 So, thank you and hats off to you for the good drawing and for being brave! Your talent isn't gone, your eye is getting better and YOU want to be better than you were; so you lose confidence a bit. you have a talent.. keep it alive..
You know what…. when you are not in good mood and try to do something, you will not do it perfectly…you should have the motive and love to do it in good way. 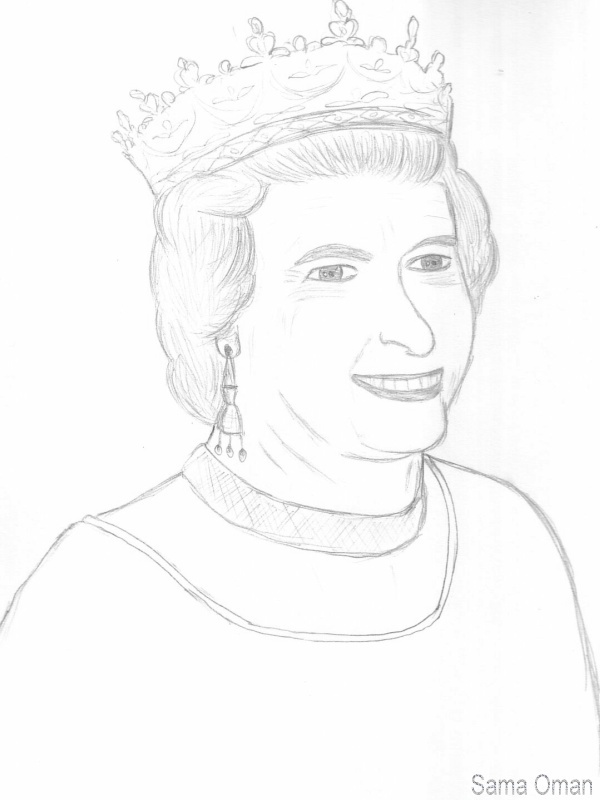 See for example my drawings of Cat Stevens/Yusuf Islam and Lady Diana …I loved them and I wanted badly to draw them. I drew them while I was watching their pictures inside my PC. Because I wanted that, I drew them in good way and I was in good mood. 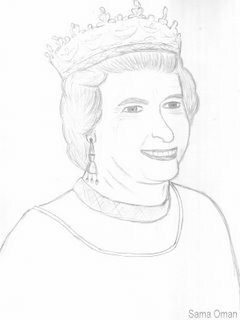 Now, I love Queen Elizabeth, but I never drew old people and I didn't draw anything for long time, so the talent like tools rusts if we didn't use it a lot. Well, I will try to draw more and improve my skills instead of bemoan on my Shining Old Days. Gmr14: thanks Dear…I will En Sha Allah. You keep drawing, Sama. Draw even when you don't feel like it. I'm glad if I can help you feel encouraged. You SHOULD feel encouraged! And if you ever need more cheering up than writing can produce, you're welcome to call. You have my phone number (703)892-0544; feel free to use it. You are welcome to stay anonymous, but I'm not anonymous, my identity is free to the world! And also: I'm sure you will find an encouraging person in Oman if you need one. I know Omanis are very nice people. Maybe the right one is right around the corner and you will meet tomorrow! Or the next day... You will find what you need, I am sure. Well, yea, there are many Good Omanis… that's for sure. Thanks for offering support…lol…I have your number. But is it a mobile?. Anyway, I'm really bless to have gorgeous people here. Not a mobile, just my home phone! Don't be shy to leave a message "This was Sama," if you didn't get me and at least I'll know you tried. Maybe even if you don't want to do it, I'm thinking that if you know I trust you and I'm happy to hear from you, that will encourage you anyway! Three cheers for your Future Golden Age!